This beautiful scroll is for an Iaido practitioner in the Western US. I am so honored to be given this artwork to make into a scroll. 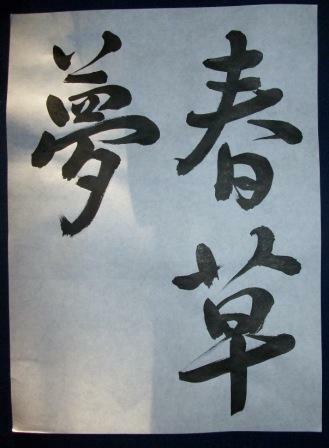 The Calligraphy was given to this Martial Artist as a gift for the extensive research and direct lineage to this sword school in Japan, Muso Jikiken Eishin Ryu. This Iaido style traces its lineage back 22 generations to the founder Hayashizaki Jinsuke Minamoto no Shigenobu. 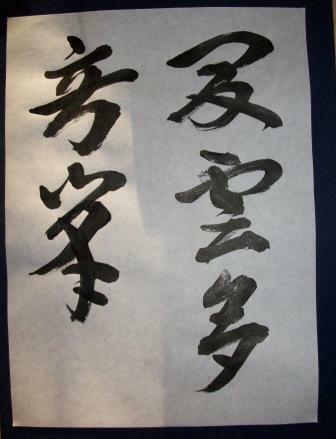 It is written in the Kaisho style, and reads Hayashizaki Iai Dai Myo Jin. The owner of the artwork confirmed to me that it would translate The Great Patron Deity of Iaido. Similar to Tenshin Katoryu it is said that this sword style was presented to Hayashizaki Jinsuke Minamoto no Shigenobu after praying for 100 days before the deity of the shrine, Kuma no Meijin. This scroll was one of two ordered by a customer. This was a scroll acquired by his father and he wanted to have it remounted. 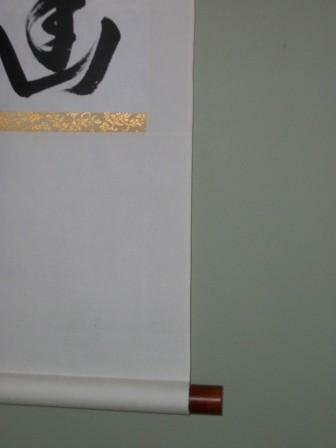 This scroll was in the sandan Hyougu style with a paper Ten and Chi. 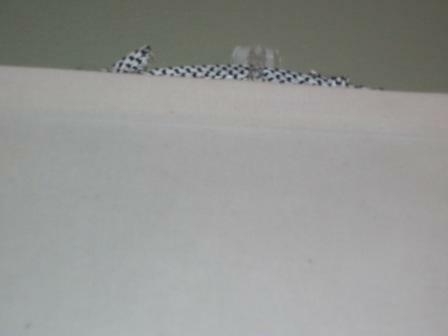 The Hassou was completely removed from the scroll and the paper was ripped terribly bad. There was also some stain on the Chuumawashi. So I took off about 5 bun on the top and the bottom of the chuumawashi to keep dimensions consistent. I then mounted some Khaki cloth that I had on the drying board previously for another project. I then put another layer of Sourauchi on the work and let it dry, it came out pretty nicely. Although it says on my website that it takes about 1 month to create a scroll, sometimes based upon the work it may take longer. In the case of this scroll, it did take longer, much longer. This beautiful scroll has been in the works since the beginning of December 2010. The customer asked me if I could frame this large piece. The artwork is about 4 1/3 feet wide and about 2 feet long. My greatest concern was not only the size, but the fact that it was wider than it was long, but the fact that it was painted in colored sumi. Color sumi has a propensity to bleed (滲むnijimu) during the Hada Urauchi process. After consulting with my sensei, I determined it would be possible to do the work. The next process was to decide on the 裂地 kireji or cloth. 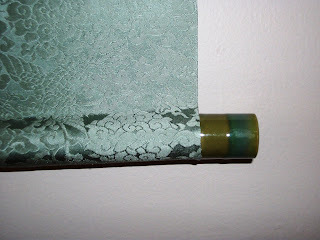 The customer said they wanted a celadon color for the cloth. In Japanese celadon is 清滋 Seiji, which is a term used in Chinese ceramics to denote a jade or light green glaze. In Japan it is more of a teal or aquamarine. I asked my Sensei and he matched a perfect cloth. Mind you the cloth was a very high quality 三丁正絹 Sancho Shoken (Pure Silk). 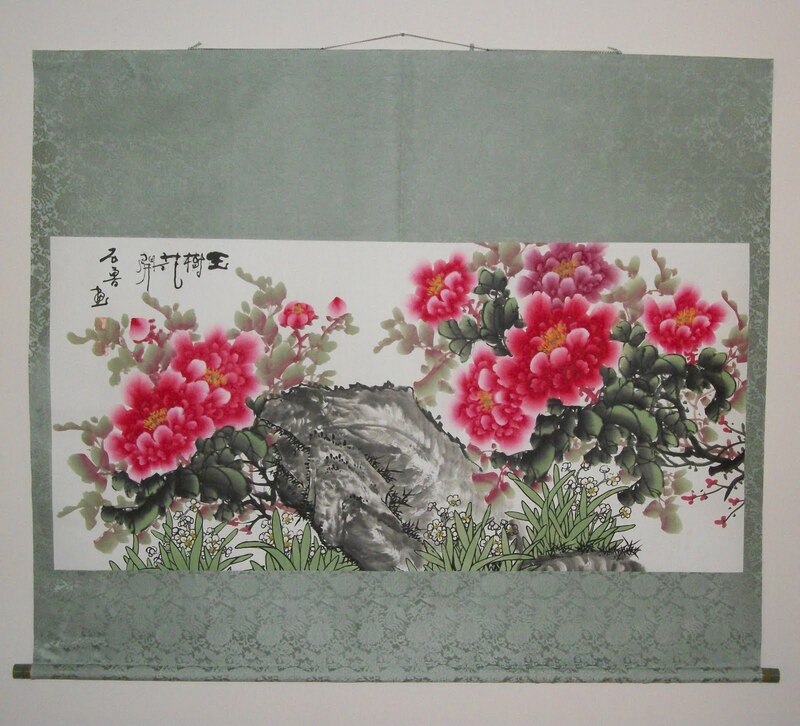 There is a beautiful pattern of phoenixes and chyrsanthemums in the cloth. This was a very expensive cloth. Because of the width of the artwork, it was decided that the scroll should be done in the 袋表具 Fukuro Hyougu style which forgoes a border of 一文字 ichimonji along the top and the bottom of the artwork. When the artwork came, it was prepped by painting Dousa eki and sprayed with a Nijimanai spray before applying the Hada Urauchi. The cloth was not wide enough to make the scroll, so care was taken to cut two matching patterns of the cloth and then combine them to have the needed width for the Ten and Chi. I also let the works at different stages spend more time on the drying board. I appreciate the fact that the customer was not pushing me to finish the scroll in a certain amount of time, and when I said it would be better to let it hang longer, the response was always “take your time to do it right”. The two tone green and blue ceramic 軸先 Jikusaki (end caps) seem to provide a smooth transition between the cloth, but also helping to bring out the green in the painting. 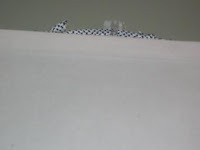 In all, I have to consider this my masterpiece work of 2011. It has been about a year and a half since an order for a scroll from a bonsai enthusiast was placed. This scroll is very soothing. It is a nature/serenity poem about the stillness when deep in the woods. The writing was done in the sousho format. The cloth is bone colored. The Kakehimo is takuboku (which is crow in Japanese. I will repost dimensions tomorrow, but it is a little over four feet. The Sakura (Cherry Blossom) Stained Shitan (rosewood) jikusaki really add to the overall elegance and character of this scroll. Along with the Deep gold ichimonji used to capture the rays of light reaching one as they are hiking through the forest. One of my customers finally sent back some pics of their scroll after they arranged everything. This is like a little personal meditation and training area. You can see the statue of Buddha with the pictures of the founder of Aikidou Morihei Ueshiba on the right and left. I think this is really pretty, and it makes me feel good that the scroll can be a part of this persons daily spiritual development. 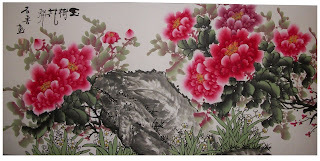 This writing is also for an individual that will attend my scrollmaking seminar at Bonsai in the Bluegrass. It is a good summer phrase as one section of a poem that would be used for all seasons. Unfortunately, Yoshimi does not like how it turned out and is going to rewrite shortly. Written in the Sousho style. Life concerns itself deeply with nature’s changing. The sweltering summer is said to be symbolic of the power of life. The bright blue, cloudless summer day of early afternoon lends itself to the towering summer cloud. The cloud seems to transform into the shape of a mountain, and this is the meaning of 奇峰Kihou. It is a magnificent sight. This clouds development causes a boiled up feeling of excitement, and the meaning of this poem is representative of how the excitement of life unfolds. 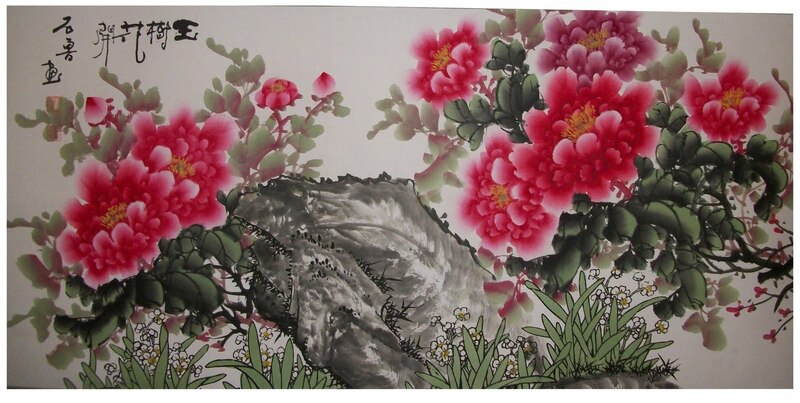 The source, known by the field and country poets, is one verse of the poem “Four Seasons” by 陶淵明Tou Enmei. 「春水は四沢に満ち、夏雲奇峰多し。秋月明輝を揚げ、冬嶺孤松に秀でず」。In the springtime, the melting snow fills the streams to almost overflowing. In the summer, powerful clouds are forming and flying high overhead. In Autumn the moon is reflecting brightly, and in the winter the lone pine clinging to the side of the mountains summit stands tall against the bitter cold wind. People seldom plan to go deep into nature, and this poem helps us to understand the beautiful countryside. This is another writing for the Bonsai in the Bluegrass scrollmaking class, which will be held all day on June 16, 2011. This student wanted a Spring Early summer themed poem to make a scroll for their bonsai display. Coming to the decision of the final poem was both difficult and arduous. However, I think this phrase conveys a beautiful sentiment for a bonsai with a spring season theme. 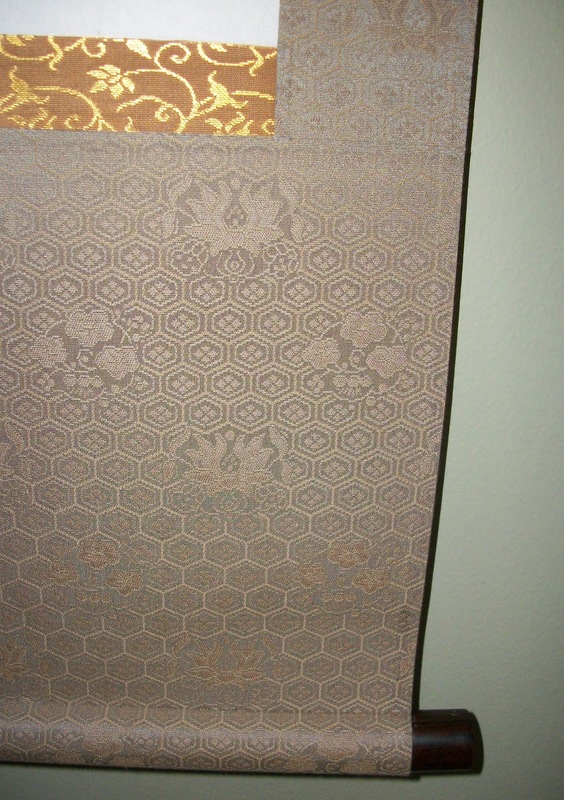 Although I did recommend the customer to have the work done in the Sousho style, they preferred the Gyousho. A young and tender new spring grass is like a far off dream that you see as you doze off. The source for this phrase is Shuki’s 朱熹 Impromptu Poem 偶成詩　少年老い易く学成り難しwhich means, The youthful years pass quickly before one accomplishes much learning. (Source is http://www.csse.monash.edu.au) As yet we can’t remember the luxuriant beauty of the flowers in full bloom on the embankment of the pond. The meaning of this poem is hoping our dreams mature throughout life, by singing with the joy that Spring brings. On the other hand, the word Dream’s (yume) happiness reminds us that sooner or later all things have transience to them and an impermanent state. For things to change is the norm of life. With all that however, there is a joy in dreaming and reaching for the stars. Also, we must remember that to have a dream is not only the special privilege of youth. For example, even if one does not realize the dreams they have as children, they can continue to dream as an adult to lighten a burden. Isn’t this sometimes good to have these dreams as we age? Do not say to yourself, “I am no longer young”, and you will not limit yourself in your possibilities. We must always have and continue to have wonderful dreams throughout our lives.